Leave it to Mercedes to think about making a 3D movie that defines speed. Mercedes SLS AMG, a closed section of the Isle of man, an ex-Formula 1 star and BBC presenter David Coulthard, Britains best 3D teams, boom cars and choppers. Assemble Britain’s brightest talents in 3D technology. 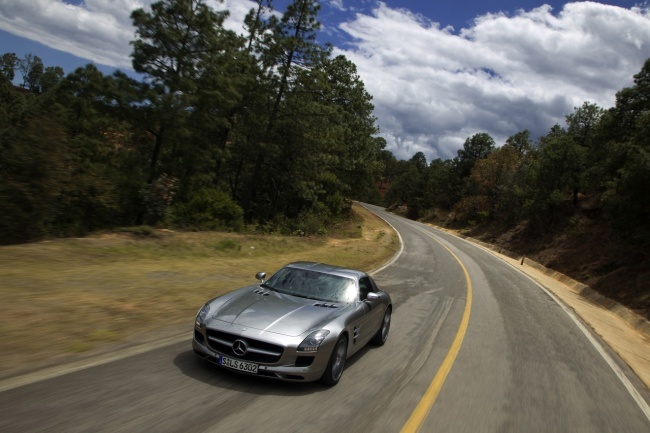 Ask David Coulthard to drive the SLS AMG as fast as he possibly could (and mind you – he is fast). Track the paces with “another” Mercedes SLS AMG with a boot 3D camera (driven by none other than rally ace – Robbie Head), a modified 4×4 with a V10 engine, special boom cars and several helicopters. Check out the video (in true 3D) on Sky’s 3D pub channel this Sunday. Wired reports that the producers have brokered a deal “with a major electronics brand” to show it on the company’s gear across its stores. You can also check out the trailer for the film, and a “making of the film” below.